A new year means many new resolutions that can be a bit pricey if you’re not careful. If you’re looking to get in shape this year, then you might be surprised by how much a gym membership or even having your gym can set you back. Luckily, there are a few accessories that can help boost your workout without forcing you to spend a fortune on other workout supplies. So, if you want to get in the best shape of your life, don’t purchase more than you can afford, because these ten items are bound to get you on the right track. A good pair of shoes is probably the best things you can purchase when it comes to getting in shape and helping your body to work out without doing a lot of damage. A pair of good shoes will actually last you some time too, so you won’t have to worry about spending a fortune again and again. When looking for a pair of shoes, try to find a shoe that caters to your needs opposed to one that simply looks nice. The best thing you can do is find a shoe for the workouts you plan on doing. There are great shoes for running and walking which should actually suit your needs substantially. Of course, if you do plan on cycling, climbing or other specified activities then you’ll want to cater your needs toward that specific sport. There are a lot of great options to choose from though, which is bound to allow you to meet your athletic needs while also helping your body stay comfortable. Without a doubt, a good pair of shoes can make or break your workout, so shop around until you find the right fit for you. A yoga mat is one of the most basic items that you can purchase for your workout routine. This mat will make your yoga experience more enjoyable and will help you progress in the activity. Your yoga mat doesn’t have to be especially used for yoga though. Rather, you can incorporate it into many areas of your athletic life. For starters, your yoga mat can easily be transformed into a great place to meditate and might even help you further your experience. It is also a good spot for doing basic exercises like sit ups and pushups, as well as activities like Tai Chi that might require you to balance more efficiently. Your yoga mat will last you some time with proper care too, so you won’t have to worry about this cheap investment consistently effecting your budget. Lifting weights can be one of the best ways for many people to start working out. These simple workout accessories are perfect for anyone trying to improve on strength or those hoping to tone up. Weights can be purchased in a variety of shapes and sizes too, so you can choose the material and the weight that meets your preferences. The best thing about weights is you can customize your needs for a lot less than you would need to with other workout supplies. Weights cost just a few dollars a piece and can even be purchased in sets to ensure you can get have a lot of options to choose from. Generally, weights are some of the first items to go on sale too, which will allow you to save even more money If you can wait for a sale to arrive. If working on your core and balance is something that seems to be appealing to you then a balance ball is certainly something you should invest in. The great thing about balance balls are you can find one for next to nothing and they are easy to patch up if they are damaged. You can do many basic exercises on your balance ball, which will actually improve on the effectiveness of the exercise. On top of that, you can enjoy workouts like Pilates and yoga with this accessory in your possession. If you want to keep your body going even when you’re enjoying yourself, then the ball can also be used as a chair. This will engage the core and will keep your body burning more calories even when you’re at rest. Another great item to have around the house is an aerobic step. This workout accessory is perfect for many aerobic programs. However, it can also be used in a series of other workouts too. For instance, if you are working on improving the strength in your calves then an aerobic step can certainly help you on your way. You can also cater workouts to the aerobic step using a search engine and a little elbow grease. An aerobic step doesn’t haven’t to be purely for exercise either. In fact, this piece of equipment might come in handy if you need to grab something from a shelf that might be too high. You can also use it for sitting and resting when you’re feeling a bit tired from all of your movements. This accessory is easy to store too, which will come in handy if you don’t have space to leave out your workout gear. When it comes to building a home gym, your best option is to think functionality. Purchasing a home gym can set you back quite a bit, so it is important that every piece in the gym serves more than one purpose. So, when it comes to choosing items, your best option is to buy multipurpose equipment. Usually, these gyms have a wide variety of options to choose from. Some of the more popular options allow you to work out a variety of muscles on one machine. These usually cater to arm and leg workouts, which will help maximize your gym. Of course, if you can find a machine that allows you to do weight training and cardio then you will be better off. These machines can truly help you get the most out of your fitness goals, as well as the money that you put into your home gym. These days, apps can help us do so many great things. 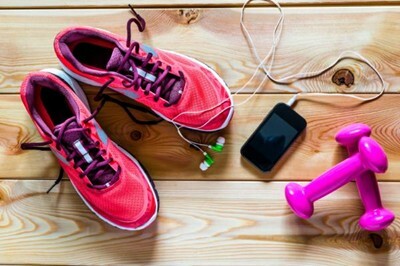 One of the most beneficial things you can use your phone for is finding great workouts. There are so many apps to choose from if you’re looking for an exercise routine or even just workout videos to keep you going. Some of the apps will even help you customize your workout to suit your body’s needs. Of course, you might run into a few apps that will charge you a bit of money. However, when it comes down to it, your best option is to try the free apps before you make a commitment to purchasing something. You should also work with apps that offer free trials instead of making a commitment early. Workout apps aren’t the only option to choose from either. You can also find apps that help keep track of your fitness. Some of these apps even include food journals and dietary advice. These apps might not help you work out, but they can truly be an asset when you’re feeling discouraged by your progress or you need to find a way to improve your workout and fitness levels. A lot of people don’t use resistance when working out, which can really cut back on the workout you deserve. Having resistance gear on hand can help you take a workout to a new level which might offer you more muscle tone or even help you lose weight faster. The best thing about resistance gear is you can purchase one form and use it in many different ways. You can even use your resistance gear on basic stretches that you might do during your warm up. The best thing about this purchase is you won’t have to worry about it costing a bundle as resistance gear tends to be cheap and lasts quite some time. When it comes to working out, one of the best things you can do is have fun with it. For a lot of people, lifting weights, doing everyday exercises and walking or running are frustrating, boring or simply not enough to keep them going. Instead of focusing on this type of exercise, you might want to take some time to enjoy something you actually do love. For instance, if you used to like to play basketball as a kid, then purchase a ball and head to your local court. Playing might help you get back in shape while allowing you to find some time for you. If you’re not sure which sport to play then start with something simple like a soccer ball, which you can enjoy without others. You might also consider something out of the box, like a badminton set, which is great for entertaining others. Even a bowling ball and shoes can help you get on the right path to a healthier lifestyle. Foam rollers are relatively new for many people. So, they aren’t quite as popular as other workout accessories. That is why so many people overlook them when purchasing the supplies needed to get healthy. Foam rollers have actually been proven to help you workout and recover more efficiently though. You can use a foam roller before a workout or after, in order to work out your muscles and prevent painful cramps caused by your workout. Using the foam roller will also burn some calories, which is bound to help you on your weight loss journey. You might find your foam roller to be your favorite piece of equipment, once you find your workout groove. Getting in shape and treating your body right doesn’t have to be a money pit. These helpful tips should allow you to purchase the accessories you need to work out efficiently while also allowing you to cater to your budget. Now, meeting your new year’s resolutions will be easier than ever.